Good way to your readers can reward to as they like. they can pay via Paypal. yes its very easy way, so lets try this.Sign it to your papal account. 3. Just scroll down and find the (Donation) link Click on donation icon, after fill your personal details the information like your Organization name/service. 4. Now click (Customize Appearance).and filling the information and click (Create Button). 5.Now you can see HTML code, just copy this HTML code. 1. Sign In to your blogger and click "Design" on your dashboard and click "Page Element". 3. Now paste code,what You copy from Paypal and save it. 4. After you can see Paypal donation button from your blog. 3. Paste your code to HTML area and save it and open your blog and see donate button. 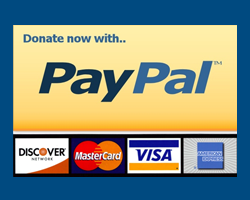 your Paypal Donate button in appear in your blog, Enjoy it.